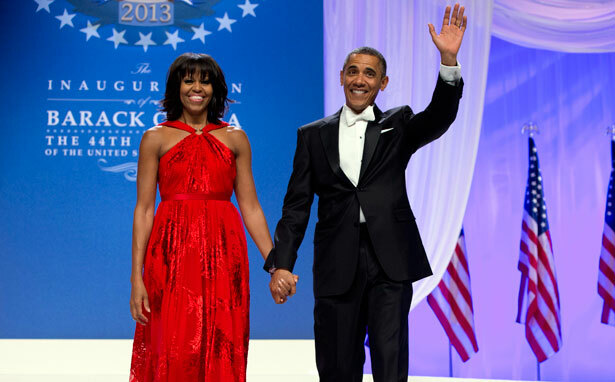 As fashion's first couple, the Obamas can take a leading role in making sure US companies comply with global standards. We mark the one-month anniversary of the horrific Rana Plaza disaster, the collapse of an eight-story building in a suburb of Dhaka, Bangladesh, which killed more than 1,110 garment workers. Rana Plaza has proved to be a watershed moment, galvanizing a global call to action to clean up the fashion industry. But it has also revealed a major roadblock to reform: fashion brands aren’t held responsible for what happens in the factories that make their products, and American clothiers are merely giving lip service to tougher standards. Here’s where we are: more than a dozen major European fashion brands—including H&M, Tesco, Primark, Benetton and Mango—have signed on to Accord on Fire and Building Safety in Bangladesh, a legally binding, landmark agreement that requires brands to make their suppliers in Bangladesh submit to independent inspections, make the results of those inspections public and help fund any necessary improvements to building safety. Dishearteningly and embarrassingly, the vast majority of US retailers—including Walmart, Gap, J.C. Penney, Sears, Kohl’s, Target and Macy’s—have not signed on. Walmart, one of the largest buyers of clothing from Bangladesh, has decided to inspect its suppliers itself. The suggestion that Walmart is capable of monitoring its own supply chain is particularly appalling, given that it is linked to the Tazreen factory fire, which killed 112 Bangladeshi workers in November, and also sold jeans from a supplier that placed an order in Rana Plaza. President Obama has been eerily silent on the issue, though there is much he could do. If Obama is unsure of how to act, he might start where former President Bill Clinton left off in 1996. Following a string of sweatshop scandals (including the infamous case of Walmart’s Kathie Lee Gifford brand, whose products were found to be made by children in Honduras), Clinton established a presidential task force on apparel made up of labor leaders, human rights and religious groups, and reps from companies like Nike and L.L. Bean. Aside from improving the factories, the task force’s goal was to give Americans a way to track the conditions under which their clothing was made. In the past fifteen years, the apparel industry, and the world, have undergone seismic changes, for which Obama’s twenty-first-century apparel task force would have to account. Clothing imports to the United States have skyrocketed since 1996 (we now manufacture only 3 percent of our clothing), which makes monitoring conditions that much more difficult—and crucial. But this is an opportunity for real change here and abroad: lifting wages and conditions for garment workers worldwide will benefit workers in places like Bangladesh as well as give our country’s garment and textile manufacturers a chance to compete. The government of Bangladesh recently announced it would increase the minimum wage and allow garment workers to form unions without the approval of their employers. These are promising developments; wage increases and the right to unionize must be realized and protected. We also need the leadership of our first lady, a fashion icon who shops at H&M and Target, which produce clothes in Bangladesh. She must help change the culture of fashion in the United States. Ultra-cheap consumer goods contribute directly to our economic woes and are linked to human tragedy abroad, yet Americans celebrate bargain fashion and have stockpiled our closets with gobs of disposable trends. Fairly and affordably priced fashion should be our new goal—and, obviously, fashion should never come at the cost of lives. Michelle Obama would be the perfect spokesperson for such a message. The Clinton-era task force was a good start, but the new presidential task force should fulfill the promise that people be able to trace where their clothes come from. Our government and courts must also tighten the reins on clothing corporations. It’s time that fashion brands submit to tougher standards and heightened regulation. That’s why the president must pressure American fashion brands to sign on to the Accord on Fire and Building Safety in Bangladesh, and help us see once again that when fashion companies, garment workers, unions, governments and consumers work together, fashion can be a force for good, providing jobs in safe and healthy conditions. Josh Eidelson discovered Walmart clothing at the scene of the Tazreen factory fire last year.